REEL 1: Background in GB, 1920-1939: story of joining the RAF, 1939; civilian employment in factory; reasons for enlisting with RAF and reaction of parents; childhood interest in aircraft and photography; educational qualifications; reason for training as mechanic; opinion of skill levels among RAF mechanics. REEL 2 Continues: Aspects of training with RAF in GB, 1939: basic training at RAF Cardington; attitude to discipline; uniform and kit; drill; marathon run in gas mask; dress parades; posted to St Athan, Wales for further training; opinion of training; sporting activities; reaction to outbreak of war, 3/Sep/1939; technical training; exams; drop-out rate; passed fitter’s course as aircraftman; duties of fitter and rigger; relations between ground crew, senior officers and pilots; story about stealing rations; reason for being posted to fighter squadron at Duxford, 10/1939. REEL 3 Continues: description of duties with 617 Sqdn RAF in Italy, 1943; comparison of duties with bomber and fighter squadrons; opinion of American air crews. Aspects of period as engine fitter at Duxford Aerodrome, GB, 10/1939-8/1940: opinion of Blenheim bomber; daily routine and duties of flight mechanic; parades; problem opening No 1 hangar doors; organisation and role of 222 Sqdn; further comments on Blenheim; story of death of air crew in accident; description of Duxford Aerodrome and airfield; opinion of accommodation; story of arrival of WAAFs; memory of cold weather; REEL 4 Continues: messing arrangements; Christmas dinner served by officers; opinion of officers; technical equipment; use of tents to cover Spitfires; priming engines according to temperature; reliability of aircraft and engines; personal toolkit; problem of lifting heavy loads without cranes; problem of lack of spare parts; security on airfield; opinion of RAF Regiment; guard duties; opinion of preparations for war; fire service; painting Spitfires; aircraft identification system; question of camouflaging aircraft on ground; story about American NCO; description of picketing aircraft to prevent blowing over; story of servicing Blenheims for use by Russians; problem of shortage of ground crew for fighters during Battle of Britain, 1940. REEL 5 Continues: shifts and guard duties; opinion of food. Aspects of period as engine fitter at RAF Hornchurch, GB, 8-11/1940: air raid and damage to airfield; accommodation and messing arrangements; sleeping arrangements and description of ‘biscuit’; daily routine and duties; granted four days ‘war strain’ leave; attitude to bombing of airfield; story of visit from Duke of Kent during air raid; story about pilot Willie Atherton; land mine dropped on airfield and defused; first impressions of Bristol Beaufighter; comparison of day and night duties in GB and North Africa; maintenance and preparation of aircraft. REEL 6 Continues: opinion of Merlin engine and reliability; comparison of various fighter aircraft; attitude to loss of aircraft due to poor maintenance; story of Spitfire crashing on airfield and investigation; attitude to fear; fatigue and mental condition of pilots; length of time taken to prepare aircraft during action; opinion of Len Deighton’s book ‘Fighter’; willingness of pilots to continue operations. REEL 7 Continues: scramble procedure and preparations for take-off; reason for leaving canopy open on Spitfire; attitude to politics; story about RAF Manston; rate of replacement of aircraft; opinion of Air Transport Auxiliary; various memories of pilots; duties as flight mechanic with 89 Sqdn RAF in North Africa. REEL 8 Continues: construction and lighting of runways; story of Spitfire crashing with mechanic on tail plane; description of Spitfire undercarriage and flying characteristics; problem caused by fitting IFF system on Spitfire; reaction to loss of air crews; attitude to danger and being under fire; description of air raids on airfields. REEL 9 Continues: further description of air raids; attitude to using air raid shelter; problem of recurring nightmares; story of Beaufighter crashing on airfield and casualties; leave; attitude to courage; memories of black US air crew in Naples, Italy. REEL 10 Continues: reason for nicknames ‘junior’ and ‘square wingtips’; explanation of term ‘mickey-mouse raid’; opinion of effectiveness of bombing airfields; attitude to outcome of war; composition of A Flight at RAF Hornchurch; number of personnel; opinion of pilots; story of applications to be air gunner and flight mechanic; reason for volunteering for overseas service. REEL 11 Continues: story about Jewish mechanic; comparison of bomber and fighter pilots; relations with pilots; pride in unit; story of fight with French soldiers in Ismailia, Egypt; confidence of pilots in ground crew; opinion of competency of pilots; story of flying in Beaufighter; various memories of Douglas Bader. REEL 12 Continues: further memories of Douglas Bader; modification of gun button; use of battery trolley to start engine; extra time required for Bader to climb into aircraft; RAF jargon; swearing; pilots’ attitude to enemy kills. REEL 13 Continues: air displays by pilots over airfield; attitude to CO; further memories of Douglas Bader; role of camp commander and CO; flights for ground crew in Miles Magister; opinion of army; problem of lack of information; story of manning Lewis gun in Italy; attitude to rumours. 2017 was a bumper year, read a small selection of the great feedback you gave us on our Air Shows in 2017. Field Marshal Bernard ‘Monty’ Montgomery was the most famous British General of the Second World War. 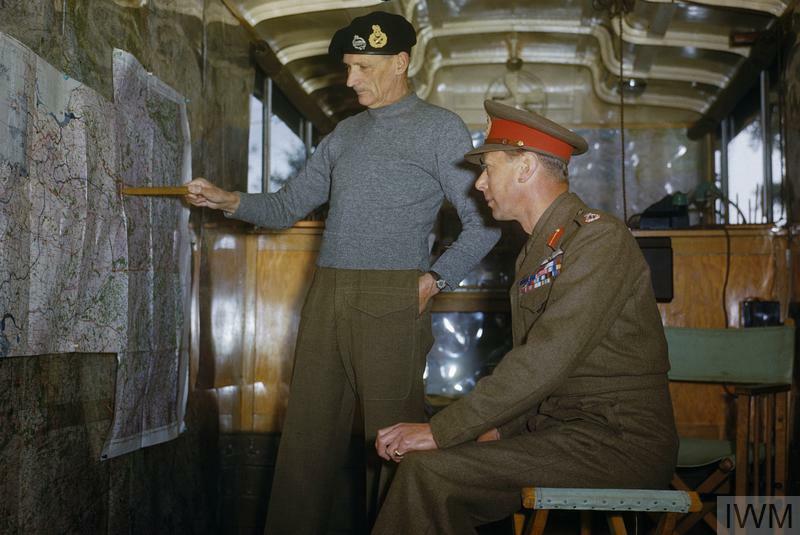 A charismatic leader of men and popular figure amongst his soldiers, Montgomery conducted his campaign in North West Europe from three command caravans: one for his office, one for his bedroom and one for his map room.